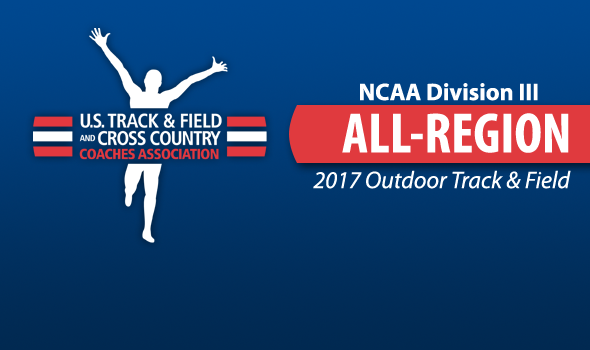 NEW ORLEANS – The U.S. Track & Field and Cross Country Coaches Association (USTFCCCA) has announced the All-Region honorees for the 2017 NCAA Division III Outdoor Track & Field season. The top-5 individuals in each event from each region – as well the region’s top-3 relay teams – earned All-Region distinction. The regions used for this award – Atlantic, Central, Great Lakes, Mideast, Midwest, New England, South/Southeast and West – match those used during cross country and the indoor track & field season. A total of 935 men and 945 women nabbed All-Region honors for their efforts during an incredible outdoor track & field season that was highly competitive and entertaining. No men’s team earned more All-Region honors than Christopher Newport, out of the South/Southeast Region. The Captains hauled in 29 honors, led by Ryan Scott who earned 4 by himself after performances in the 200, 110 hurdles, 4×400 relay and the decathlon. The team with the second most honors was Rowan, out of the Atlantic Region. The Profs, who have been at or near the top of the NCAA Division III National Team Computer Rankings all season long, were led by Shai Mumford’s trio of honors (100, 200, 4×100 relay). No women’s team earned more All-Region honors than Claremont-Mudd-Scripps, out of the West Region. The Athenas captured 24 All-Region nods as four women hauled in three or more led by Tyra Abraham’s four (100, 200, 4×100 and 4×400 relays). Emory and Nebraska Wesleyan each corralled 20 All-Region honors. The full list of All-Region honorees can be found below. Don’t forget that the 2017 NCAA Division III Outdoor Track & Field Championships will be held this weekend, May 25-27, in Geneva, Ohio.